Carl Sandburg High School has three jazz ensembles, all of which are co-curricular. The Jazz Ensembles are very honored to once again be invited to perform in the Lincolnway Central Jazz Festival. Jazz Ensemble II is one of three competitive jazz ensembles at Carl Sandburg High School. Jazz II has seven performances throughout the year. We would like to thank LWC and their staff on running a fantastic festival, we look forward to this performance every year. The Gwendolyn Brooks Middle School Jazz Band is out of Harvey Public School District 152 located in Harvey, IL. The band has become an source of pride for the entire city of Harvey. The band has received national recognition for its dedication to the jazz education and commitment to musical excellence. Despite the age of its members, the Gwendolyn Brooks Middle School Jazz Band seeks to inspire the world through the performance of jazz. The Homewood Flossmoor White Jazz Band is one of three big bands at Homewood Flossmoor High School. The band tours consistently with the Homewood Flossmoor Viking jazz ensemble , directed by Sarah Whitlock, and Homewood Flossmoor High School Red Jazz Band. The red and white jazz bands are directed by Andy Hoefle. HF Combo I is one of three jazz combos at Homewood-Flossmoor High School. This band is made up of students learning to improvise and perform a variety of styles in the jazz idiom. The Jazz Program at Homewood-Flossmoor High School consists of three performing ensembles, and two combos. The Viking Jazz Band is the school’s top performing Jazz Ensemble. The Viking Jazz Band is extra curricular ensemble that rehearses one day a week throughout the year beginning in October. The Viking Jazz Ensemble performs three concert throughout the year and participates in an international tour every three years. The ensemble consistently participates in Jazz festivals throughout the state and has established a high standard of musical performance over the years. The band is directed by Sarah Whitlock. The Jack Hille Jazz Band is from Oak Forest, IL and is excited to return to the 2019 LWC Jazz Festival. The band is made up of students in the 6th, 7th, and 8th grade who audition to be part of the Jazz Band. Students in this group practice twice a week before school. Over 220 students participate in the Hille band program. Students can be part of 3 grade level Concert bands, two Jazz Bands, a Woodwind Ensemble, and a Percussion Ensemble. Grade level bands meet during the school day as a curricular classes. The Concert Band and Jazz Band have been past performers at the Illinois Music Education Conference (IMEC). The Concert Band has also been a clinic band at the Midwest Clinic. The Concert Bands have earned consecutive division I rating at the Illinois Grade School Music Association (IGSMA) band contests. The Joliet West Jazz Ensemble is an extracurricular group made up of members from the band and orchestra program. The band performs regularly around the area including recent performances at JJC, Hackneys and Heroes West. The Lemont High School Jazz Ensemble is an ensemble comprised of experienced members and newcomers to the Jazz idiom. Local festivals, parent and public concerts, as well as clinic experiences comprise this group's performance efforts. The ensemble is open to freshmen through senior members of all musical backgrounds, and will be featured at the 2019 Lemont Jazz Band Dinner Dance fundraiser on March 2nd. The Liberty Jazz Band rehearses two days a week and is comprised of 7th and 8th grade students. The band performs regularly at school concerts, festivals, community events and performs yearly at a Chicago Wolves Hockey Game. The Lincoln-Way East High School Jazz Ensemble consists of one player per part and membership is determined by a yearly audition. 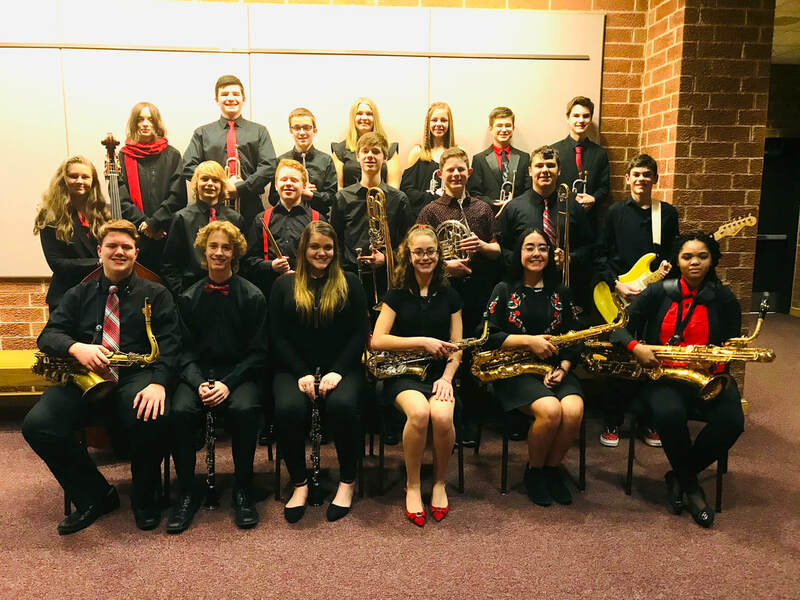 The Jazz Ensemble performs regularly at school and community events, has performed multiple times at Chicago's Jazz Showcase, and has consistently been rated amongst the best high school bands in the midwest at regional festivals. Lincoln-Way West Jazz 1 is in it's 10th year as a school and band. Each year they perform in many festivals and performances and continue to look for new opportunities to play and learn about jazz music. The Lisle HS Jazz Ensemble is directed by Scott Gumina. They perform annually at our fall jazz concert, Lisle’s own “Cabaret Night”, community functions, and our spring jazz concert featuring prominent, Chicago-area professional jazz musicians/educators. We also regularly “open” for local, professional big bands. In January of 2015, the Lisle HS JE was a performing group at the IMEC in Peoria. This is the second year and first full year of the Martino Jazz Band. We meet two days a week before school. The Mokena Junior High Jazz Band is excited to be back at the LWC Jazz Festival! This is the group's first year back at Mokena Junior High and our second performance of the year. The Oak Prairie Jazz Band meets from October through April on Mondays and Wednesdays from 2:45 to 4pm. The OP Jazz Band participates in many festivals throughout the year, including the Naperville Big Band Festival, Evanston Jazz Festival, the Prairie State Jazz Festival and the Lockport Area Jazz Festival. In addition to Festivals, the Jazz Band has performed with the Brass Tracks Jazz Orchestra and the Pete Ellman Big Band. Joe Madden, Alto sax. Arnav Anand, tenor sax. Landon Florancic, Gtr. Stone TeSelle, timbales. Destina Sarussi, alto sax. Joe Madden, alto sax. Thank you to all the staff, faculty, and volunteers that make this event so wonderful every single year. This is our 9th year participating, and we always look forward to this day. The Rich Central Jazz Ensemble is comprised of students that are actively involved in the concert band program. The students rehearse after school once per week and attend festivals throughout the state of Illinois. The Tuesday Jazz Band is looking forward to their tenth annual performance in the LWC Jazz Festival! The group is comprised of seventh and eighth graders who meet once a week for an hour after school. The goal is to introduce them to various styles of jazz and to develop an appreciation for this art form. We hope that everyone enjoys their performance! The Westmont High School Jazz program consists of two bands that meet at 7 AM during the school year. The ensembles perform regularly across Illinois and the Midwest at various festivals as well as other venues in support of the jazz idiom. Each member of the group strives to continue the traditions of the jazz greats through their performances in regards to style, technique, and energy.